The house is old and the walls are thick; if only they could talk, think of the stories they might tell. And then they did, ankle high in our living room. This is what they said. Is it a family of weasels? or pine martens? Our motion detect camera is in position, trained on a couple of likely holes on the outside. More to follow. 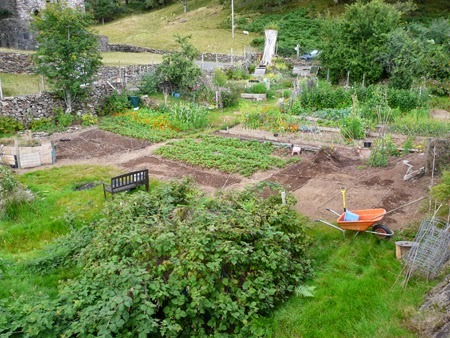 Gardening can be hot, sweaty and boringly repetitive, especially when weeding, but every now and then something magical crops up. 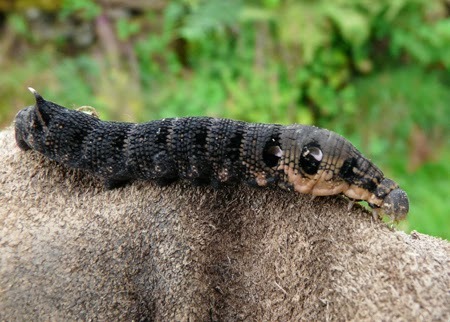 Today’s discovery was an unusual caterpillar or larva which I’d never seen before. But I was surprised when someone replied to my Tweet that it was the larva of an elephant hawkmoth – I’d seen one of those before and it was bright green. How come the larva of the elephant hawkmoth can be such different colours? Both share the huge ‘eyes’ and trunk like proboscis. 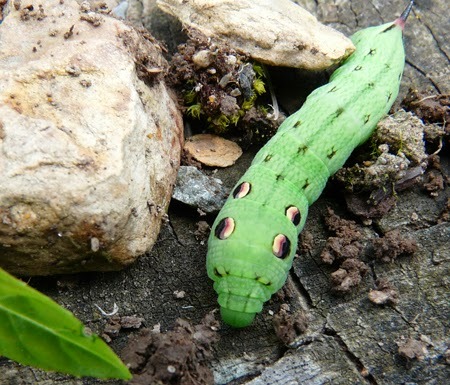 Green Elephant Hawkmoth with scary big eyes! Our original plan had been to kayak the Dwyryd down to Borth y Gest but the tides were no good. Instead we went up Moelwyn Bach and as we looked down to Portmeirion it looked as if someone had pulled the plug. The view on the lower slopes has changed a lot with the removal of the larch now almost complete. It’s good to see the occasional oak that for so many years has been hidden in amongst the conifers. Everywhere is very dry but the mountain still has plenty of wet spots. At one stage we were walking along a shallow stream being patrolled by a Golden Ring, presumably looking for a mate. It latched onto my walking stick and was very reluctant to let go; I think I was being given the evil eye and told to get off his patch. The beauty of going up is that the cooling breeze gets stronger and soon you’re above the bracken line and into the bilberries – there’s a bumper crop. Pop a hot, sun-warmed berry into your mouth and it explodes with flavour. Now that Haydn is a geology student we are trying to be a bit more purposeful in our walks and took with us the brightly coloured geological map of Snowdonia. 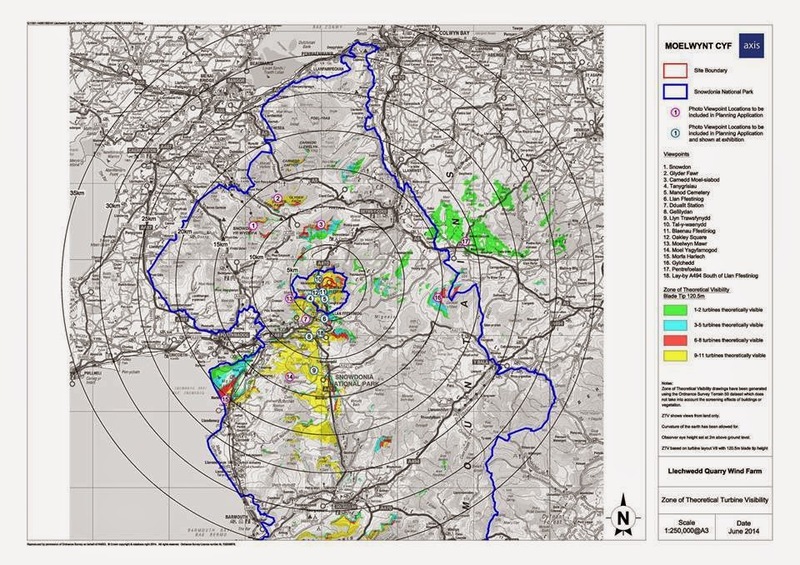 Our local mountain has so much variety which is evident from the many bands of colour on the map that need to be crossed to get to the summit; it’s also evident simply looking at the rocks themselves. Exotic sounding Breccia is my firm favourite. Birds were keeping a low profile in the hot sun but butterflies were out in force, lots and lots of Small Heath. Also loads of little white butterflies (or moths?) – must take a closer look next time. Bog Asphodel was striking and so too the Sundew. Towards the top I noticed a compact plant that I now know is called Alpine Clubmoss. A perfect day. A powerful Stihl strimmer helps me keep on top of the garden, eliminating bracken from the steep hillside to the railway and keeping reeds at bay. A bank of grazing grass, in a sea of gorse and bracken, is very welcome to the farmer’s sheep. Strimming is noisy, messy and not very wildlife friendly. Where the vegetation is thick, around the edges of the veg patch, it’s hard to see what creatures might be lurking in the undergrowth. That’s why the motto is 'rake first, strim second'; the St Francis approach. 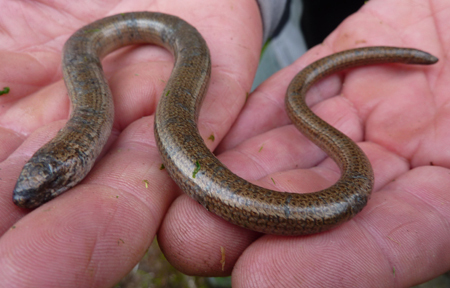 My reward on a dull morning was a slow worm, barely warm enough to move. 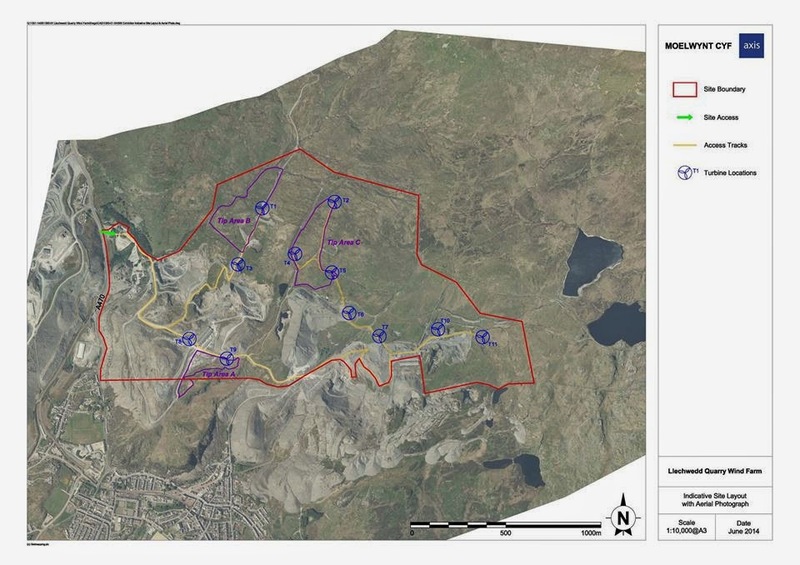 Larch trees on the slopes of Moelwyn Bach are being clear felled in an attempt to slow down the spread of the disease phyotphthora ramorum. It’s also known as ‘sudden oak death’ and affects over a hundred different species of tree and shrub including the oak. But larch is the most susceptible and once the larch is removed other infected species tend to recover; I certainly hope so as the oaks in the Maentwrog nature reserve are priceless. The disease was confirmed in spring 2013 and orders were issued for immediate felling. Due to the large number of infected woods and forests across Wales there has been an excess of work and a glut of wood for the mills forcing the price down. As a consequence the Welsh government has allowed the work to be prolonged. Whatever replaces the trees will need to be phytophthora resistant as the disease remains in the soil for up to 15 years. Coed y Bleiddiau Uchaf is an old farmhouse with walled paddock just beside the railway and near the former railway inspector’s cottage. For years it has been engulfed by trees but the trees have been removed from all around and hopefully the ones inside the boundary will be felled without damage to the walls. In 1841 it was lived in by William and Mary Roberts and their five children. 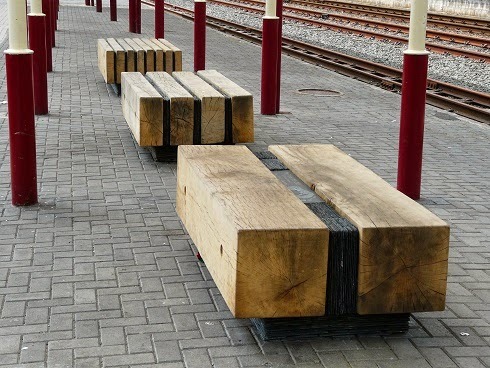 Three benches have been placed on the platform at Blaenau in memory of Roy Woods, who wrote the guide books for the Ffestiniog and Welsh Highland Railways. I thought the benches looked great but after Howard Bowcott, the artist who also did the town centre, explained the symbolism, I now think they are even better. Slate is the most relevant material but a bit too cold to sit on in north Wales, so wood has been used with slates in between. Eight lengths in the first, four in the second and two in the third. This echoes the saying engraved on one of the giant chisels … TEW WYTH, TEW PEDAIR, TEW DWY (FAT EIGHT, FAT FOUR, FAT TWO) – terms for various stages of the final splitting of slate to the thickness of eight slates, then four then two. The same benches can also be seen around the River of Slate and in the centre of the car park set on slate rails to represent slate wagons. As for comfort Howard explained they were set at the optimum height of 43cm – perfect for but would the same be true for taller people? 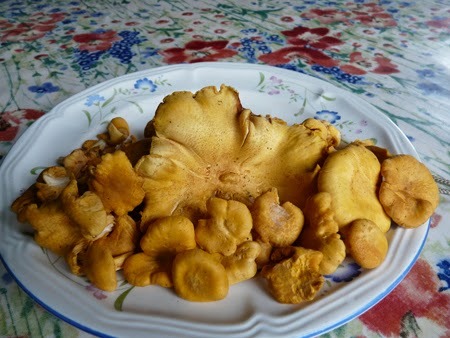 Lunch today was a feast of mushrooms on toast; golden-orange chanterelles with an essence of apricot. Picked yesterday morning after a couple of days rain. It feels as though the season is starting early this year. For logistical reasons (Sherpa buses) our Paul Gannon geology walk starting at Pen y Pass was switched to the foothills of Snowdon, just above Llanberis. I’d done this walk with Paul a couple of years ago and had only half understood what was said so was hoping to get the other half of the story. The weather was fine but hardly tropical as I tried to come to terms with the explanation of tectonic plates and that the spot we were standing on had been beneath the equator about 600 million years ago. If I’ve got it right our rocks were created by underwater volcanoes, when our continental plate collided with an oceanic plate, but the mountains followed much later when our continent collided with another continent. An oceanic plate is denser than a continental, so when they collide the denser one goes beneath and this is called subduction. But when two continents collide they buckle, fold and squeeze the rocks into the mountains. Our mountains emerged about 400 million years ago and were about the height of the Alps, but have been shrinking ever since. The Alps are much younger, a mere 30 million years, and are still growing, but eventually erosion and weathering will bring them down to size. For the next few thousand years Snowdonia will stand still; rising spring-like since the melting of the glaciers but eroding by a similar amount. Our rocks are mainly from the Cambrian era, about 450 million years ago, but lying in the footpath was a gneiss rock from a much earlier era - how did that get there? Either by glacier from Anglesey or imported rock for footpath maintenance. Paul explained the three types of rock, volcanic (or igneous), sedimentary and metamorphic, but we would be concentrating on sedimentary. The three types of sedimentary rock are called mudstone, siltstone and sandstone with the names referring not to the chemical composition but the particle size with sand being the largest and mud the smallest. From here we were shown an example of graded bedding, layers of sediment with the larger particles sinking towards the bottom of each layer, and could see the angle at which the rocks had been buckled and bent. Looking down steeply onto Nant Peris we were next to a fantastic example of tension gashes. These sandstone rocks had been horizontal in the sedimentary phase but during the mountain building phase had been put under huge amounts of tension and bent upwards. Cold rocks would be ‘brittle’ and shatter but hot rocks, 10 to 15 kilometres beneath the surface, would be more malleable or ‘plastic’. We were presumably looking at sandstone coming from the crossroads of that zone with brittle deformations at one end and plastic deformations at the other. Along the way I began to feel more comfortable with the geology beneath my feet, it started to make sense and I thought yes, you’ve almost cracked this subject. From ignorance to a little bit of knowledge with tentative understanding and then despair as I realised the enormity of how much more there is to learn. Maybe it will all become clearer if I buy the revised 2nd edition of Paul’s book The Rock Trails of Snowdonia? 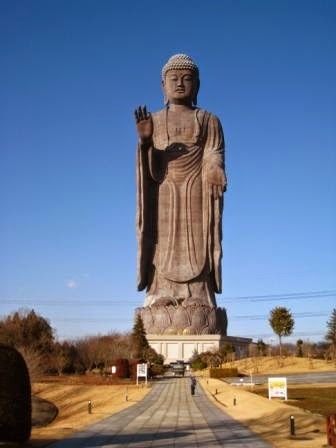 Maybe Paul could take me on this walk for a 3rd time? Thanks very much to Paul for donating his time and to the Snowdonia Society for organising this geology walk. Write ups of previous geology walks are here and here. This year’s gathering of the sheep has been in three stages and the first two sheared batches have been kept in the field opposite the front of the house, towards Blaenau. Each batch, of maybe a couple of hundred, was ushered up the drive with Molly standing guard to stop any left turns up the path; she’d love to be a working dog and watches the farmers and the other dogs intently. On each occasion a lamb or two has been separated from the flock, stuck on the wrong side of the fence, and the all-night bleating outside our bedroom window can ruin a good night’s sleep. Yesterday morning I guided a lone lamb up the edge of the fence into the funnel by the stile onto the railway. I had caught a couple here the day before, and lifted the light balls of fluff across the fence, but this one was determined not to be caught and tried to run past. For the first time in years the curved end of my shepherd’s crook came into play, hooking the lamb and pulling it up short as it rushed past my legs. It was an instinctive reaction and I felt like a proper shepherd! Having my hair cut this morning I shared my moment of shepherding glory with the barber who asked whether I’d used a normal crook, for catching round the neck, or a back leg crook which has a much narrower hook. He explained that the back leg crook gives you an extra yard to play with as the sheep rush past you. As he snipped and trimmed my mop he confided that he was shearing long before becoming a hairdresser. 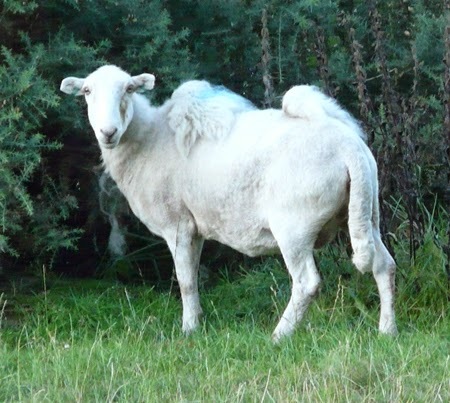 At the bottom of the drive in the field by the river I saw one of Dewi’s sheep modelling the latest coiffure as a two-humped (Bactrian) camel. Doesn’t she look beautiful! 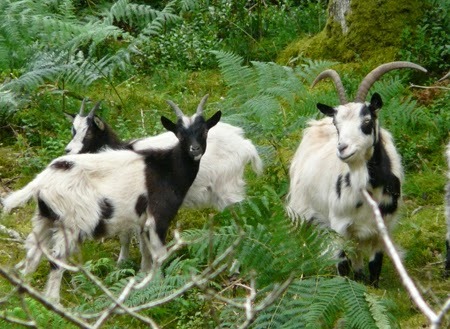 Meanwhile, out in the nature reserve, the two new kids were looking fine and must be five months old by now. The colour of the water in the stream coming down from Coed y Bleiddiau is a bit muddy after all the tree felling above the line. Not many to go now and then it will be time for re-planting something other than larch which will be resistant to Phytophthora ramorum (sudden oak death).